One of the distinctive artwork Indonesia especially Javanese culture, Batik. Batik art is usually painted on fabric. And generally batik fabric was made into clothes, bags, shirts, and pants. But now we are trying to apply the art of batik for media presentations. So, we created this powerpoint template with batik theme. 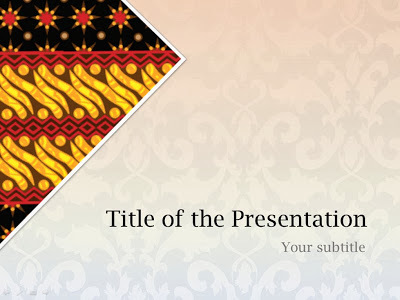 Batik template is easy to use and applicable in a variety of themes your presentation. It is also our efforts to preserve the culture of Indonesia. You can also participate in preserving the Indonesia culture with download and use this template for your presentation.